Terex has announced the sale of Demag mobile cranes to Tadano. At the same time, the company says it will exit the North American mobile crane product lines manufactured at its Oklahoma City facility. Tadano has commented on the company’s planned acquisition of Demag from Terex. While much will develop during the acquisition process, the company’s comments may give some insights into the future of the Japanese company’s two German mobile crane businesses, the former Faun in Lauf an der Pegnitz and Demag in Zweibrücken. More detail will come when the deal closes, which is expected to happen in mid-2019. A Liebherr LTM 1450-8.1 removed an LTM 1250-5.1 from bridge construction site on the A3 motorway to the south of Würzburg, Germany. 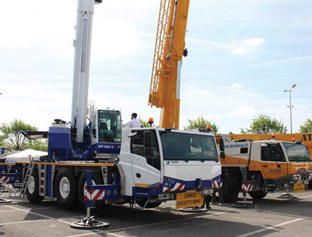 17 April, 2019	After a very successful 2018 event, Vertikal Days returns to Castle Donington this year and promises a number of exciting product launches for the UK. The two day event will take place on 15–16 May at Donington Park in the East Midlands, one of the famous grounds of British motorsport. 18 April, 2019	The Thames Tideway project in London replaces a Victorian sewerage system that was a wonder in its day. Julian Champkin looks at the many lifting tasks and problems of such a huge infrastructure project. Felbermayr supplied lattice boom and all terrain cranes for the expansion of a wheat starch factory in the Lower Austrian town of Pischelsdorf. Through a series of case studies, we look at how the energy sector is creating demand for heavy lifts and special transport in the USA. Julian Champkin looks at how diferent approaches to house building—both innovative and traditional—have driven different approaches to lifting materials around the world. Sustainability, disenchantment with plastic, and the use of new wood products such as cross-laminated timber in construction are placing new emphasis on the timber industry. Julian Champkin looks at the cranes that serve the industry. 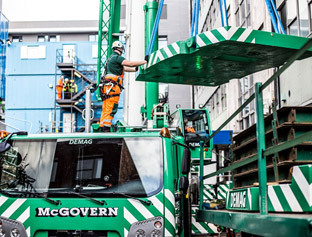 18 April, 2019	In this issue, two of our lead features look at the impact of infrastructure projects on demand for lifting equipment. There is a concept in political science known as the Overton Window, after its creator, Joseph Overton. Overton argued that political policy is set within a window—ranging from 'more free' to 'less free'—of public perception of acceptable ideas. Over time, the limits of this window of acceptability change, and the policies politicians propose change with them. This month, I've been taking a look back over our news coverage for 2018. There have been quite a few significant developments over the year. 17 May, 2017 Green Pin® introduces the Power Sling® Shackle in action! Founded in 1918, Akerstroms Bjorbo AB develops, produces, markets and services robust products to a global market for radio remote control of industrial cranes, mobile applications, door-opening systems and locomotives. On Thursday 14th April 2016, the 4th day of BAUMA 2016, KOBELCO celebrated the order of MAMMOET for 17 units KOBELCO cranes with a speech and handshake followed by a traditional Japanese sake ceremony with the MAMMOET team and the KOBELCO team dressed in MAMMOET red Japanese happi coats. Ceremonial hammers were used to break open the sake barrel, after which the sake was shared with the gathered crowd in typical Japanese square wooden cups with the logos of MAMMOET and KOBELCO branded on opposite sides. KOBELCO also handed over to MAMMOET: a Kabuko samourai helmet, sword and bow with arrows.